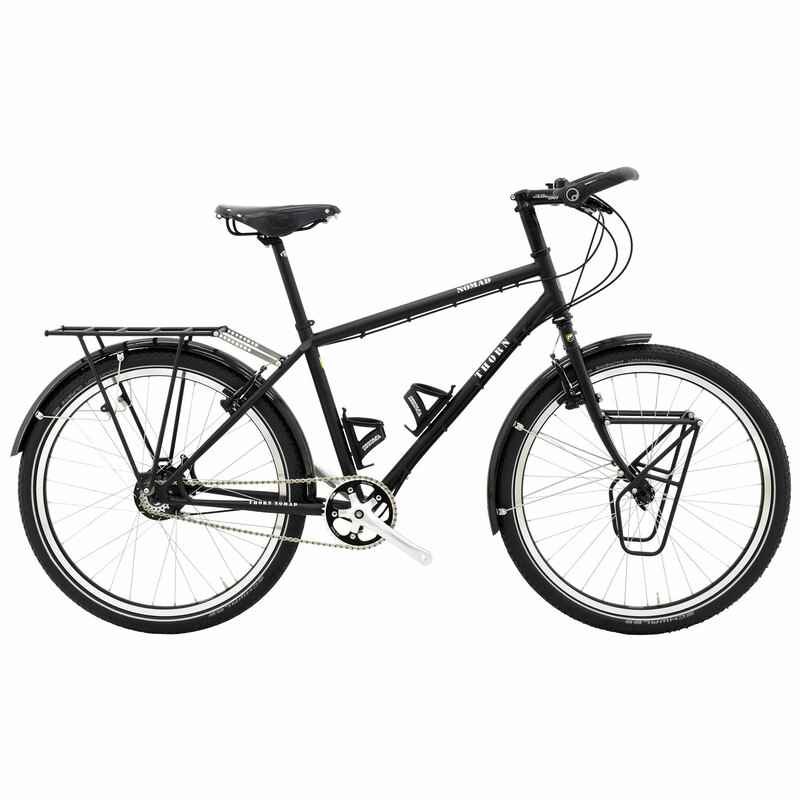 Thorn Nomad touring bike, built up in a sensible specification for expedition touring. We often get asked for these at short notice, so we have some of these machines ready to go with popular options already specified. Its got the ultra bomb proof Thorn Nomad frame, the superbly reliable Rohloff hub 14 speed hub gear system, thick and reliable Ryde Andra 30 Rims and a Shimano Front hub. We have added what we believe to be the most versatile touring tyre with the best weight/performance ratio the Schwalbe Marathon Dureme in 26x2.0. Thorn Carriers front and rear mean you can carry everything you could possibly want to on a bike, whilst retaining the Nomads famed stability when fully laden. The rider gets to sit on a Brooks England B17 leather saddle, and holds a pair of the finest Ergon GP5-L grips with a multi position bar end. We have fitted 2 bottle cages for convenience, the frame has a fixing for a 3rd cage if required, the bike is finished with mudguards offering good all weather protection, which adequate clearance for when the roads become less paved. All you need to do is add your own pedals, and its ready to tour the globe. Please note, these bikes are built in downtime at a very keen price, no changes to the specification are permitted, if you require any other specification please contact Thorn for a quote, this bike is exempt from the Thorn 100 day money back guarantee. Schwalbe SV13 Presta Tubes - 26" Tyres - 40-559 to 62-559"
KMC X1 Rohloff compatible 1/2 inch x 3/32 inch chain. ConsExpensive but worth every penny. ProsThe perfect touring bicycle.Put your pedals on and go. Why did I not buy one of these years ago.Perfect touring bicycle.All components are high quality.When you ride the Rohloff hub you wonder why you used anything else. i am 5,7 will this bike fit me ? Shipping cost to Vancouver, BC, Canada? Can you estimate for me the cost of shipping this bike to a residence in Vancouver, British Columbia, Canada? Thanks. How do I not pay for carriage on the system? I am interested in buying this bike, however I don't seem to be able to deselect the carriage charge as I want to come and collect the bike. I have had bad experience with couriers before. How do I not pay for carriage on the system? Thank you for your enquiry, if you wish to come in & collect the bike then your best option will be to call our Thorn Cycles team on 01278 441505. You will be able to pay a deposit over the phone & then the remaining balance on collection.